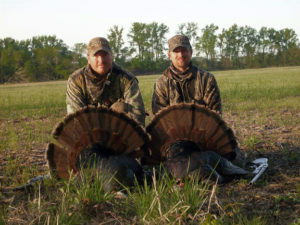 This Successful Kansas Turkey Hunting article is one of many Association hunter authored articles on this web site. Each given to us is posted as received as any different perspective may be more effective than another at communicating a common intent. Intent is a successful field experience tag filled or not. My intent in this article is to present what new to MAHA self guided hunters may want to know. An illustration about how to setup their first Kansas turkey hunting trip. Especially written with non-residents in mind. To that end a while back we started collecting information from our older Kansas turkey hunters. Our question we posed: “What components exist to a successful trip?”. A central idea we wanted to focus on included how to prepare our non-resident members on their first spring season trip. Responses were not so much about specific Kansas turkey hunting techniques. They were more about how to put the mechanics of a trip together. Good example how distant glassing/scouting pays off. We are just over a ridge. These birds would not have been seen by anyone driving by..
Another view of the same lease from a higher elevation making it look much different. The pond at center right is the only water for as far as we could see. A not so small point when scouting. Water is often uncommon. What we found out talking to Association experienced do it yourself hunters included tagging a tom was assumed to occur. It wasn’t much of a concern than which motel was cleanest. Or, which county has larger flocks. Not what we were wanting to hear. An answer to a well received first question we posed to our do it yourself hunters asked what it takes to be successful? Their answer: learn the land. We found this meant different things to different people. It largely referenced most were coming from big woods states. Hunting Kansas’ big open required adjustment being a bit of a shock. One which at first stymied many. These were those who more frequently would hear a tom before ever seeing one. A converse they found more frequent in Kansas. Long range visibility often lends to scouting by binocular . Most put aside their common big woods tactic of walking logging roads listening for gobbles. This advantage did in turn develop a sense of over confidence. Follow up lessons being a range of specific to our Kansas turkey hunting failures. These failures largely led to a misreading of a flock’s home range. This required a longer learning curve at how to identify a roost area versus daylong movement area. A common story fell along lines there were turkeys just about everywhere. They seemed to move every where without a pattern. This changed once a hunter learned to roost a flock during last hours of daylight. A more effective scouting starting point than attempting to pattern all day long activity. A significant key learning point leading to more shots. Increase success in terms of fewer days to harvest. Second, an increased number who filled both tags on a single hunt. This success many credited to setting up to ambush off a roost. A tactic contrary to many. A need to stay put rather than move came through as a key to success. However, this one step forward met with continuing, evolving trial & error. 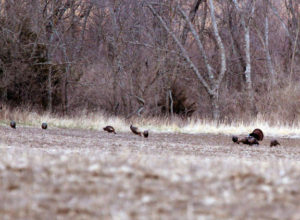 A next Kansas turkey hunting error after learning value to roost a flock included those becoming a bit over exuberant. He would press in too close for an early morning setup. Too near a roost. Exuberance became evident in stories of how someone would be well within easy hearing distance and sight of a flock in roost trees. He would watch them flydown. All seemingly disappear slowly moving away from where a hunter had setup. Or, putting too much emphasis on a roost. These hunters would go on to say how they would try to get as close to a roost as they thought they could get. An operating idea included success came from gaining a quick shot off a roost before they dispersed. It did not take long until these same hunters learned to move any setup. Or, not pressure a roost. One spot to move to included being near an anticipated strutting area. These were away from roost spots. That learning typically took two years of experience. Notably from former run & gun type hunters. When we spoke to third year self guided hunters most of these failings had given way. Most were taking less time. Most having eyes on more birds. Any failure to fill any tag was more a result of simple mistakes. Mistakes borne of routine such as moving too soon, bad shot or spending too much time on other activities like deer scouting. With MAHA many find a return each season to a known spot is comforting. It is also well liked to have adventure of exploring new areas. Being able to return consistently to familiar farms allows for an increasing levels of success. New land retains adventure of exploring. That is without anxiety of having to secure private hunting land access. Or, anxiety coming with public land competition. Of those self guided hunters who hunted Rio Grande Turkey a common comment included about how Rio tom’s looked. They appeared to be as big as any other species they had hunted. However, once weight and beard measured they were typically smaller in size. Weights reported were around 18 – 22 pound mark. Most beards under 10 inches. Seven inches common. Many of these hunters had only Eastern backgrounds. Rio Grande Turkeys was frequently a first of another species. A second most common comment, Rio toms seemed easier to call/decoy. This comparison most contrasted to an Eastern Turkey. Overall, of those who hunted youth season and regular season reported a lower likelihood of returning for youth only season. 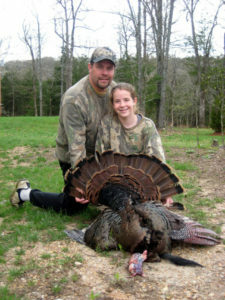 The plan for the following year was both [youth and adult] hunt during the regular season. This was so both could harvest their turkeys. Doing so on one trip. There was some confusion over interchangeable terms of Kansas turkey hunting tags and permits. This continued with management units. On tags/permits they are distributed by units with zero to 2 tags available per management unit (distinct from deer units). Both tags/permits are over counter purchase or online. All should understand understanding to buy both. On management units (different on fall to spring season) they divide the state up into separate units. That difference between the fall and spring has always been an issue. It further is complicated by their mismatch to deer management units. Our only answer is to read state regulations just before every hunt. Goal is to be sure to be in a unit which licensed. Pretty much all realized the need to purchase a new, as to current calendar year, basic license. It must be in possession along with turkey tags-permits. A hunter without concealment has to be more disciplined. More so than a run & gun hunter. This is also over a longer period of time than what many were accustomed to. Those who started without a blind they all pretty much employed one by a second trip. This relates back to largely open habitat common to Kansas turkey hunting compared to closed in heavily wooded states. A few do it yourself hunters stated they initially planned to hunt counties based on recorded statistics. Many changed their plan the next year. They were able to find a good selection of toms just about every where they hunted. Their motivation changing to spring turkey hunt where they planned to deer hunt that fall. Several told of having eyes on toms that either had exceptional beards or were noticeably larger in size. Many of these turkeys were not harvested. It appears many hunters were willing to harvest an acceptable tom rather than hunt for one of more exceptional beards or body size. Almost all first year members did use aerial photographs. Most reported them useful. If only for determining property lines. None believed aerials did much good for finding roost locations. Some new to afternoon strutting area hunting reported they gained a better understanding of strutting area selection from being on ground stumbling into one. 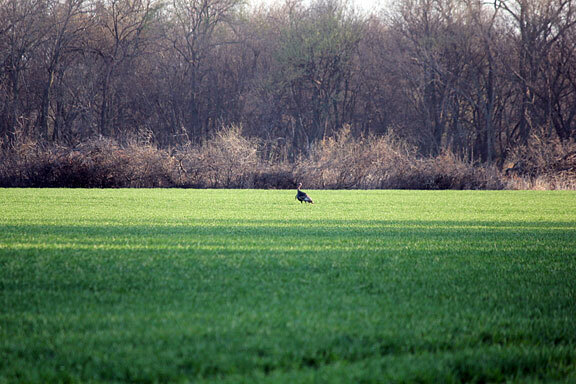 Hunters with three years of Kansas turkey hunting were less likely to use aerial photographs. A nearly universal comment concerned their leisurely pace. Hunters were able to employ their scouting and hunting effort without pressure. That was an experience lacking compared to their home state. Many reported it was common practice for jakes to be shot in their home state spring season. With MAHA a jake harvest soon was no longer a consideration. Starting with their first spring trip they observed plenty enough mature toms that shooting a jake was soon removed from their mind. Experienced hunters further reported coming back to hunt any same land lease farms allowed them to spend less time scouting. Results were successful hunts earlier in their trip. A secondary effect became shorter trips. A final common comment we actually looked for as confirmation we screened for good hunters was told they had or would have had a good hunt regardless of filling a tag or not. A good hunt was described as no pressure, plenty of birds and enjoying solitude. Overall, view point was their trip was a good experience. Enough to earn a planned return come next year. Many commented any return hunt would be to a new area.